Simplify your mobile life. Let Dolphin do all the work so you don’t have to. 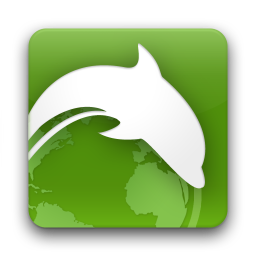 Dolphin Browser is the world's first Gesture, Sonar and Add-on enabled mobile web browser on Android.] Download Dolphin's free mobile browser and join the 50 million who enjoy the exclusive features of our mobile web browser. One-tap Share - Right from Dolphin, you can tweet web pages, post them to Facebook, share them via email, or grab the content and save it directly to Evernote (Beta) or Box. Tabbed browsing - No need to toggle between screens, tabbed browsing lets you open and switch between Web pages fast as lightning. 1. Send to device: Send links, maps, phone numbers, & more from your desktop to your phone and vice versa with Chrome/Firefox/Safari extensions. 2. Dolphin Connect: Sync easily your history, bookmarks, passwords and open tabs across Android, iOS and desktop. WiFi - Broadcast - Share links with Dolphin friends nearby on your wifi network. Gesture - Let your inner artist out and create a personal Gesture (symbol) to access the mobile and desktop websites you use the most. Speed Dial - Visit your favorite mobile websites on the go with one touch.